Daily Illuminator: Play Munchkin Cthulhu This Weekend! 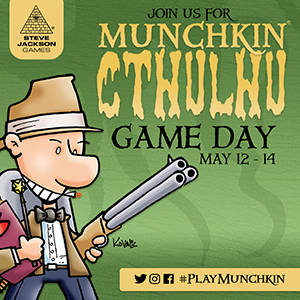 May 11, 2017: Play Munchkin Cthulhu This Weekend! The stars are right . . . to play some Munchkin Cthulhu! This weekend, May 12-14, head to your participating local game store to play Munchkin, get free swag, and maybe even win prizes. Join us for a celebration of non-euclidean Munchkin, full of elder things, cultists, and tentacles. Stores will have bookmarks and Cthulhu-themed promo cards on hand to reward savvy investigators, and you can win even more by photographing the evidence - I mean, sharing pictures of your games! Post the pics of playing at your local event on Facebook, Twitter, or Instagram, using the tag #PlayMunchkin, and you'll be entered to win a prize pack. Tag your store and they'll also be eligible for a prize! So join your fellow Miskatonic residents, battle Cthulhu, and get awesome loot! Even if you haven't played Munchkin before, this is the perfect time to try it out. We'll see you this weekend (see store for exact date/time of their event).